Discover China Highlights on this mesmerising 7 day tour. This great value new tour packs a variety of visits and experiences into seven days. Starting with a three-night stay in the lively capital Beijing you’ll see Tiananmen Square and the palaces of the Forbidden City, climb the magnificent Great Wall and admire glowing green sculptures in the Jade Factory. Then jump aboard China’s speedy state-of-the-art new transport system as you head to Xi’an by Bullet Train. Here the army of Terracotta Warriors await your exploration, along with the Small Wild Goose Pagoda and the fascinating Hanyangling Mausoleum, burial site of Emperor Jing. After a two-night stay in Xi’an you’ll fly to Shanghai, China’s largest city. Take the chance to see the city’s incredible skyline on an optional evening cruise along the Huangpu River, stroll through the stunning Yu Garden and take a tour of a silk factory during your two-night stay. Depart on your overnight flight to Beijing. Arrive in the capital of Beijing where you stay for the next three nights at the locally rated 4-star Novotel Beijing Xinqiao which has a central location, within walking distance of Tiananmen Square. Facilities include four restaurants, the main restaurant serving international cuisine, a bar, fitness centre, sauna, beauty salon and spa (charges apply). Each of the 700 air-conditioned bedrooms has a television, telephone, safe, tea and coffee-making facilities, safe, hairdryer and complimentary Wi-Fi. This morning you’ll head into the centre of Beijing, arriving at Tiananmen Square, home to the Monument to the People’s Heroes, the Great Hall of the People, the National Museum of China and the Mausoleum of Mao Zedong. Then continue to the 15th-century Forbidden City – a complex of palaces that was once the heart of imperial China. This UNESCO World Heritage Site was the centre of royal power over five centuries and its buildings and layout provide a valuable insight into Chinese culture and society during that period. Beyond lie the Hutongs – a maze of narrow streets, courtyards and lanes, home to houses, shops and eateries. Explore here independently or take an optional afternoon rickshaw ride. Lunch is included at a restaurant near the Forbidden City and for dinner you can enjoy Peking duck. The iconic Great Wall of China extends for some 20,000 kilometres and runs from east to west across the north eastern part of China. Built and added to by successive dynasties from 220BC to 1644 when the Ming dynasty concluded, it is regarded as the largest military structure in the world. You’ll have the chance to walk along the Juyongguan section of this UNESCO World Heritage Site, around two hours away from Beijing, admiring views over the surrounding countryside as you explore the wall with its watchtowers and parapets. Then enjoy a visit to a jade museum where you’ll have the opportunity to purchase souvenirs carved from the green mineral. Lunch is included at a local restaurant. This afternoon you can join an optional visit to the landscaped grounds of the Summer Palace – a UNESCO World Heritage Site. Today you board the bullet train to Xi’an, a journey of approximately five hours. This popular high-speed rail was first introduced to China in 2003 and its state-of-the-art trains can reach speeds of up to 217 miles per hour. Carriages are well equipped with large windows and foldable tables. On arrival in Xi’an you’ll check in to the locally rated 4-star Grand Dynasty Culture Hotel for a two-night stay. Xi’an was once the start of the famous Silk Road, connecting China to other Empires. As a result it became a multicultural centre and during the Tang Dynasty, which spanned the 7th to 10th centuries, was an important religious centre. Lunch and a dinner of Shui Jiao dumplings will be at local restaurants. This evening, perhaps watch an optional Tang Dynasty Show. The Grand Dynasty Culture Hotel is a centrally located, modern hotel with classical Chinese furnishings. It has a restaurant, a lounge and bar, fitness centre, indoor pool and sauna. There are 476 air conditioned rooms equipped with a television and minibar. Visit the Terracotta Warriors this morning, a UNESCO World Heritage Site. Discovered in 1974 the figures had lain undisturbed for nearly 2,000 years within the tomb of Qin Shi Huang – China’s first emperor. The 8,000 life-size warriors and horses which make up the clay ‘army’ were intended to accompany Qin Shi Huang on his journey to the afterlife, and are often referred to as an ‘eighth wonder of the world’. Afterwards, enjoy a walk along Xi’an’s city walls, dating to the 14th century and up to 14 metres wide at points as they encompass the old part of the city. Lunch is at a local restaurant. By the 14th century under the Ming Dynasty a large Muslim community had been established in Xi’an, and later you may like to join an optional food tour of the Muslim Quarter where lamb kabobs, hand-stretched noodles and dumplings are just a few of the delicacies served up on lively street stalls. 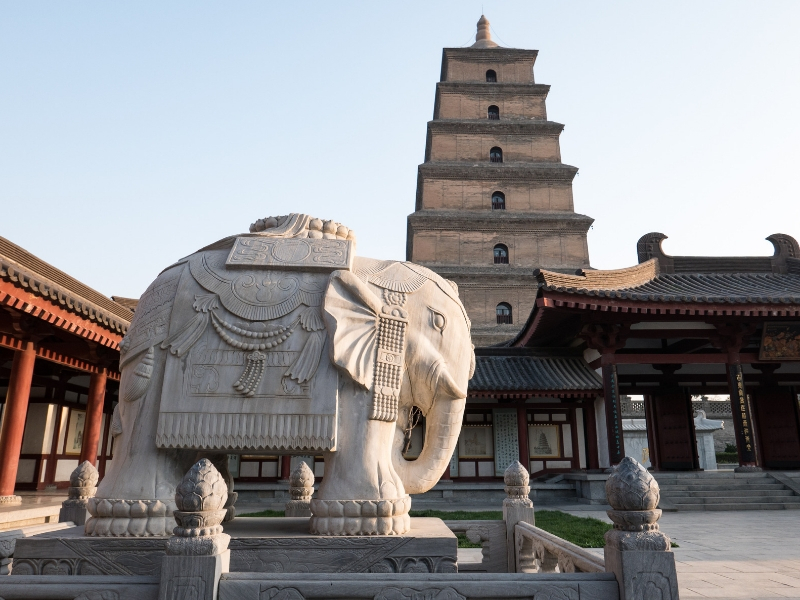 This morning you’ll venture south to see the Small Wild Goose Pagoda, which although slightly damaged by an earthquake is still one of the best preserved Tang Dynasty temples in China. The temple now has thirteen tiers and was originally built to house Buddhist scripts which were carried by the monk Yi Jing from the Indian area. From here you’ll continue to the Hanyangling Mausoleum. This is the final resting place of Emperor Jing, fourth emperor of the Western Han Dynasty, and his empress, Wang. Built in the year 153AD, the vast mausoleum also comprises a ceremonial site, human sacrifice graveyard and criminals’ cemetery. There are a number of fascinating statues to see within the mausoleum including pottery figurines of humans and animals. Lunch is included at a local restaurant before you make the approximately two-hour flight to Shanghai, China’s largest city. The rest of the day is at leisure to spend as you wish. You may like to join an optional evening cruise on the Huangpu River. You’ll stay two nights at the locally rated 4-star Equatorial Hotel. Facilities include a variety of bars and restaurants offering a range of cuisine styles, a fitness centre, tennis court, indoor pool, gift shop, beauty salon and Wi-Fi connection. All 506 bedrooms have a television, minibar, tea and coffee-making facilities, hairdryer and safe. Visit the beautiful Yu Garden, designed during the 16th century, with its six areas, classical garden design and architecture, pavilions, Zigzag bridge and famous ‘Jade Rock.’ You’ll also visit Shanghai’s bustling old town, as well as the Bund waterfront, a mile-long riverfront area characterised by historic buildings. After lunch at a local restaurant you’ll visit a silk factory to see how the cocoons of silk worms are spun into silk. Look forward to a traditional Shanghainese dinner this evening and perhaps watch an optional acrobatic show. Take your return flight to the UK.